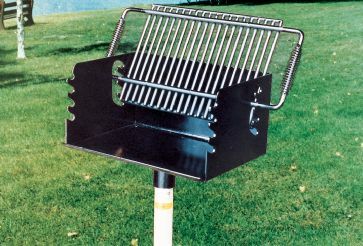 This galvanized grill features a 300 square inch cooking surface with a total size of 20" W x 15" D x 10" H. The all galvanized body is made to prevent rusting in high humidity climates and beach side properties. The grate is adjustable to 4 levels and flips back for easy cleaning. 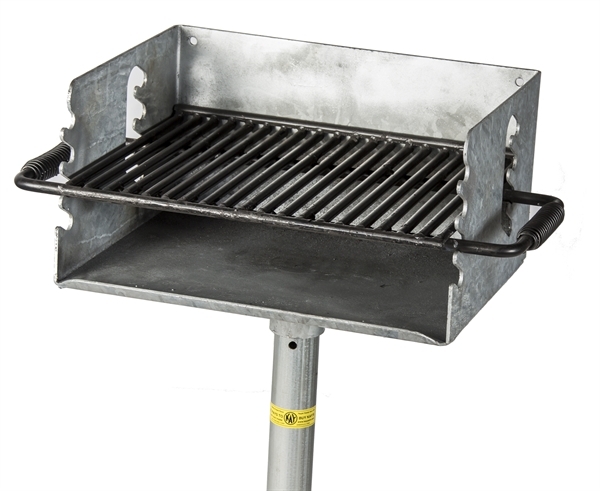 The grill is made with 1/2" steel bars welded on 1" centers with non-removable heavy-duty cool spring handles designed for public use. An ash lip helps retain coals and reinforces the fire box. Other standard features are rounded corners, drain holes and 360 degree rotation on a 2 3/8" O.D. x 41" long galvanized pedestal.